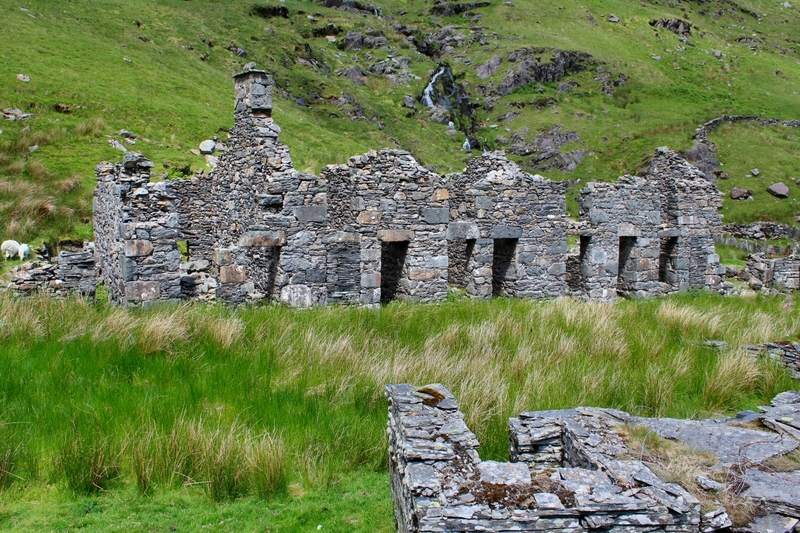 Close to the tramway, just at the start of the causeway, are these ruins of Rhosydd Stables. Built sometime around the 1850s, the stables themselves were in the main building (the part on the right was a later extension) with an upper floor accessed from the outside. Unfortunately the whole structure has degraded badly in recent years and since this photo was taken the middle gable has fallen. 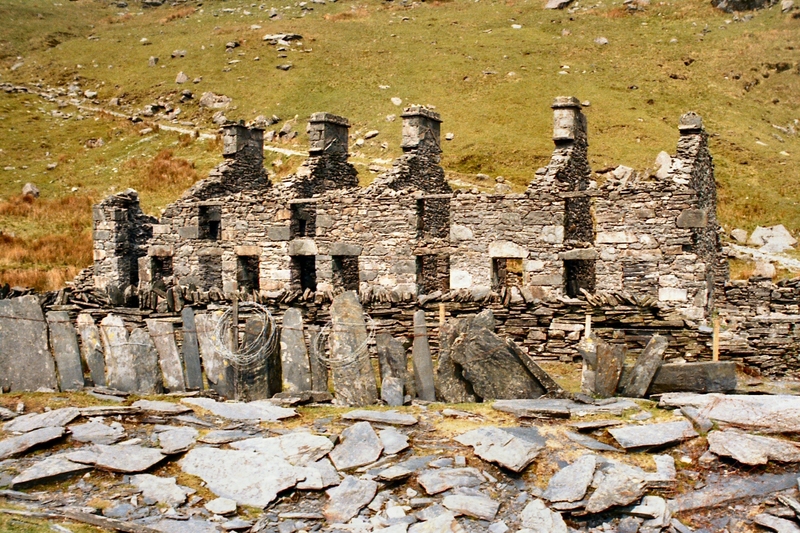 Dating from around 1856, this row of one up - one down terraces was built by Rhosydd and predates the proper expansion of Conglog in the 1870s. 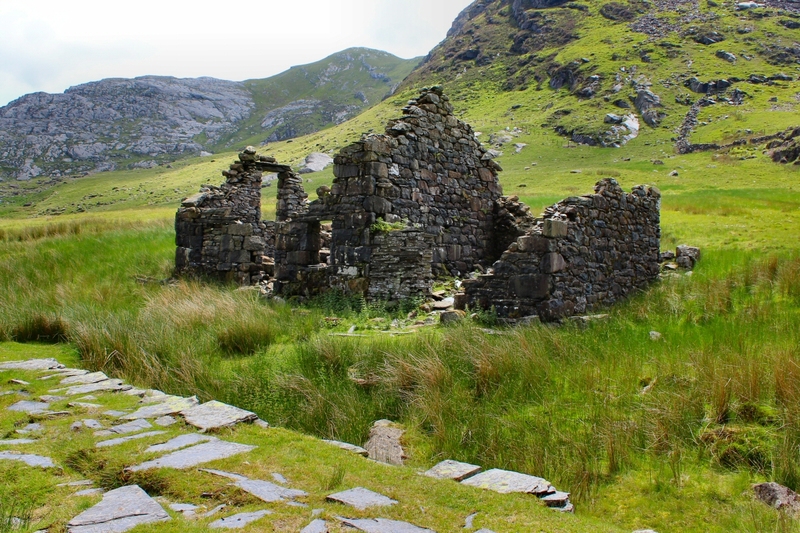 Each of the six cottages housed a family and, following the building of Capel y Gorlan, the children would attend school there during the weekdays. A short tramway from the mill to the exit tramway passed close to the cottages - running between the wall and the slate fence in the foreground. Note that although marked on maps of the era as Tan-yr-Allt, these dwellings are more commonly known as Rhosydd Terrace. Over the last 30 years i have watched most of the buildings within Cwmorthin become more ruinous as every year passes - and Rhosydd Terrace is no exception. Today it is in a very poor state with (2013) one chimney left standing and now, since this photo was taken, the far end wall has toppled over. For reference this view is of the front of the cottages with numbers 1 to 6 from left to right. 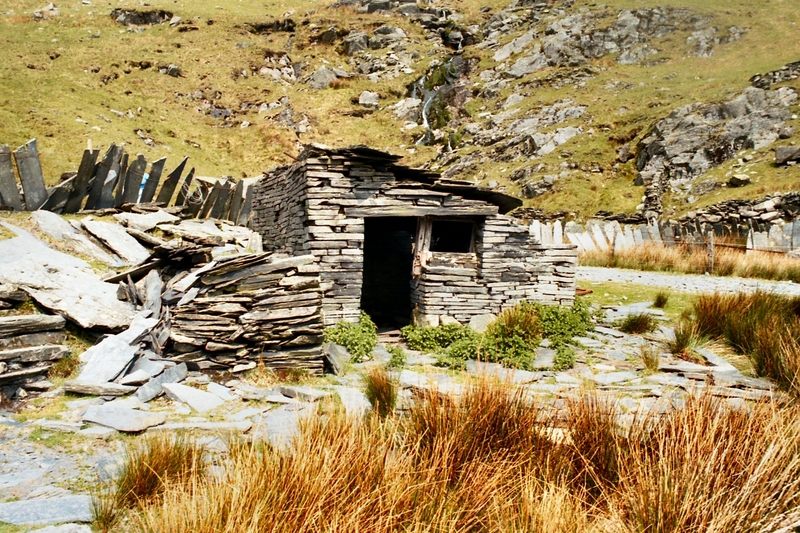 Positioned close to the start of the exit tramway, where the mill line curves around to join it, is this small hut. Its purpose seems to be unknown but given its location (in the Y of the junction) could it be something to do with the tramway? A hay store for the horse? This is the only incline on site and descends down to mill level from Floor 1 - situated just above the path to Rhosydd. The upper section is raised but from the path down the incline bed uses the hillside with no major abutments, then enters a shallow cutting before leveling out. From its base a short tramway curved off to the right and headed to the mill. 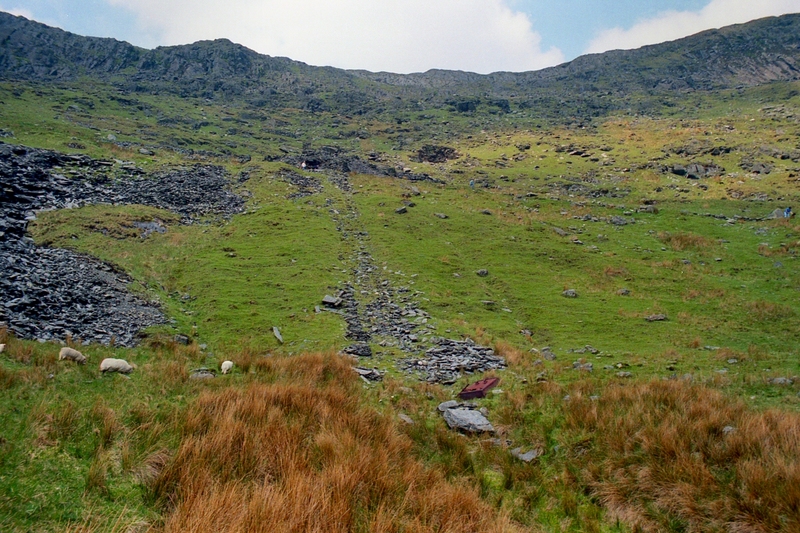 While floor 2 was connected to the incline at a point just below the path, Floor 3 (a short distance up the hillside and over to the left off camera) doesn't appear to have had a connection. Note the upturned wagon near the base.